Chocolate and mint are a match made in heaven, the perfect marriage of flavors. But I'll bet you already knew that. 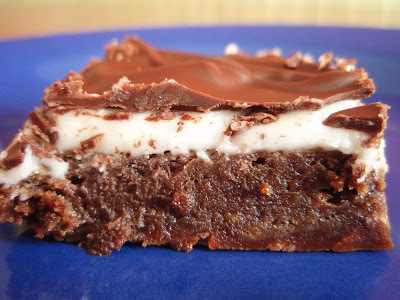 I'm a fan of Junior Mints, Peppermint Patties, and pretty much any combination of mint and chocolate that's ever found its way into my mouth, so these brownies from Joy of Baking have been on my must-make list for awhile. 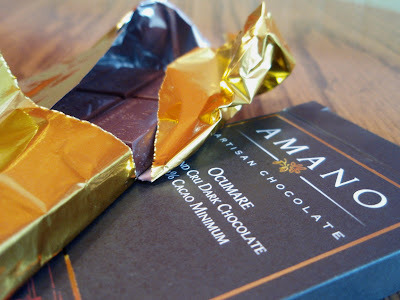 As noted earlier, I received some decadent Amano dark chocolate from Blake Makes that's just been itching to be used. For this dessert, I randomly decided to use the Ocumare bar, which is said to have an "incredible complex chocolate flavor with natural hints of red fruit." My palate isn't really sensitive enough to detect those hints (I've pretty much dashed any hope of that with my love for the hot and spicy--I'm actually surprised my taste buds work at all), but fortunately, I can still detect deliciousness. This was darn good chocolate. The brownie layer of these bars is dense and rich and ooey-gooey. The mint layer is cool and creamy and sweet. The chocolate on top (which is where I used the Amano) is crispy and crunchy and completes the bar perfectly. This recipe, my friends, is a keeper. Oh, and if you didn't understand the title of this post or my name for the recipe below, you're missing out on another of the best movies of all time. Inconceivable! Preheat oven to 325 degrees F. Grease 9-inch square pan and set aside. Brownies: Using a double boiler or the microwave, melt the butter and chocolate. Stir in the sugar and vanilla extract. Add the eggs one at a time, beating well with a spoon after each addition. Stir in the flour and salt and beat until the batter is smooth and glossy and comes away from the sides of the bowl (about one minute). Pour the brownie batter evenly into the prepared pan. Bake for about 25 minutes or until the brownies start to pull away from the sides of the pan and the edges of the brownies are just beginning to brown. A toothpick inserted in the center of the brownies will come out almost clean. Remove from oven and place on a wire rack to completely cool. Mint Layer: In the bowl, beat all the ingredients until smooth. (Add a few drops of green food coloring if you want the frosting green.) If the frosting is too thick, add a little extra milk. The frosting should be just thin enough to spread evenly over the cooled brownie layer. Place in the refrigerator for about 5-10 minutes or until firm. Chocolate Glaze: Again using a double boiler or microwave, melt the chocolate and butter. Spread over the mint filling and refrigerate for about 30 minutes or until the chocolate glaze starts to dull. Cut into small squares (seriously--this is rich stuff) and serve. I'm with you Grace, love chocolate and mint. The hot & spicy can do a number on the taste buds. Thanks for the recipe, it is always nice to come across a keeper. I have missed out on the Princess Bride. Love the combo myself. I am a huge fan of mint anything really. Your dessert looks delightful. Oh, I could sooo eat those for breakfast! Yummy! You're pictures are great! "Gwace"...I wuv the combo of chocolate and mint...I could eat a box of After 8's! Yay! You qouted my all time favorite movie! And this is sooooo a recipe I need to try. It just sounds awesome! Mint, chocolate and The Princess Bride, three of my favorite things ever! "Hello. My name is Inigo Montoya. You killed my father prepare to die." I so love that quote! Oh man, you have officially sealed the deal...I'm in love Bugs Bunny! Love it...the gooi-ness is so endearing. Chocolate and mint are like pork chops and apple sauce or peas and carrots... good seperately but better together. Maybe I should hang out with Lyb. I could park myself in front of a Princess Bride showing and feast on chocolate & mint for the rest of my life. Ok, maybe not that long but you get it. These look decadent in all the right ways. Your picture and description of your recipe make it sounds very good. I'm glad you were able to find a creative use for our chocolate and it turned out so well too! Your brownies look heavenly! Great photos. And I love those chocolate-y, mint-y layers. These are fantastic! Awesome pics - and those brownies are probably the most heavenly-sounding dessert ever. I've been on a sugar strike lately, but these look so good that I may just have to make them! YUM!!! You're such a waskely wabbit - this wuv is da best wuv. Oh Gwace that looks so incredible. I think that mint and chocolate are as good as peanut butter and chocolate! Good GWAD! First the guac and now this? I think I gained a pound just looking at that deliciousness. Here's the problem... mint and chocolate are so good, and best had with coffee. Which means, if I make these I'll have to eat them with my morning cup of joe. What's a girl to do? Brownies with a layer of peppermint and a chocolate glaze sound amazing! They look great! I have another mint recipe that I just have to send you, more of a candy. I think you would really like it. Let me know if you want me to. As You Wish. You killed my diet, prepare to die. HA! This sounds fantastic. Long time reader, first time commenter. Thanks for the fantastic dessert. Cant wait to try it. I waant these, and I don't even like mint. Yeah, I know. Sorry. An orange version calls, I think XD. Ahhh, chocolate, mint, and The Princess Bride - three of my absolutely favorite things in the whole world. I knew the reference as soon as I saw it on tastespotting and HAD to check this out. First of all, I got the meaning of the title right away. One of my favorite movies of all time ("Hello. My name is Inigo Montoya. You killed my father. Prepare to die." Love it...) And chocolate and mint are great together. Yum. After eating a few of these, I'd definitely have fun storming the castle! someone has bested a giant! i love the chocolate-mint combo. and it's yet another of the few things brian hates, so i always get anything minty all to myself. I love the True Wuv comment...so true, so true! Chocolate and mint go together like lamb and tuna fish (sorry Big Daddy was on). Those just look too good! It's criminal! Oh my gosh this looks like a giant peppermint patty! Awesome!! I just nominated you for an award on my blog :D.
Grace, they look and sound absolutely wonderful! I think mint and chocolate combination is everyone's favorite. Thanks for sharing the recipe! How come I'm always like #40 to get here? Everyone has already taken all of the wuv jokes. Looks amazing. I agree that chocolate and mint are hard to beat. That dessert looks perfect for a hot day like today. My hubby absolutely wuvs chocolate and mint anything. He goes nuts for mint choc. chip ice cream and the Girl Scout thin mints. I think this one would be a nice surprise for him! that's definitely true wuv! gorgeous! Princess Bride...one of the best movies EVER! I still have a thing for Mandy Patinkin. And those brownies? Swoon. 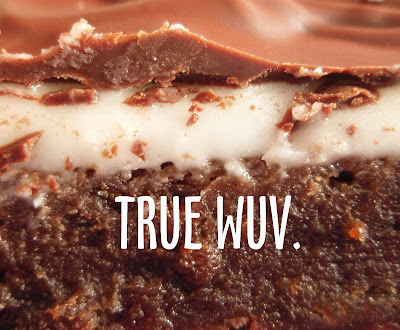 Mint + chocolate = true wuv. Definitely. My two favorite flavors for any dessert combination. This bar looks DELICIOUS! How did you know I snacked on mint chocolate earlier? LOL. This is a tried and true combo. We were just thinking about it the other day, wondering to create with these again. You've definitely got the answers for us here! looks delicious! Oh wow! Yum Yum Yum! As for you comment on my Strawberry Cake...yes, you are true..all that matters is yourself!!! Amen to that! Oh my! In construction they look a bit like a nanaimo bar...but in taste, I'll bet these are just something else! I think I am truly in Wuv. mawiage is what bwings us togewer today. I laughed so hard when I saw the title to your post. Ha! Grace I just love the combo mint & chocolate you are so right!! i just saw the princess bride (for the bazillionth time) last weekend! amazing! ohhh and the brownies! they look delicious. i too have a mint brownie that i've been dying to make. this might be the push that gets it done: your pictures are incredible! some of the best looking brownies I have seen on a blog in along time... no joke. These look amazing. Oh my my that chocolate mint treat looks like it is calling my name. Just found your blog today...our youngest was born in Amsterdam - St. Mary's Hospital. Memories! We miss upstate NY...lucky you! I'll see these mint brownies in my dreams tonight I think! Decadent isn't the word!